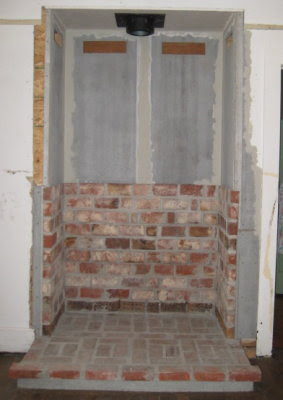 Once the brick hearth was laid (see link above), we needed to finish off the top half of the alcove. The ceiling went in first. We used firewall rated drywall. 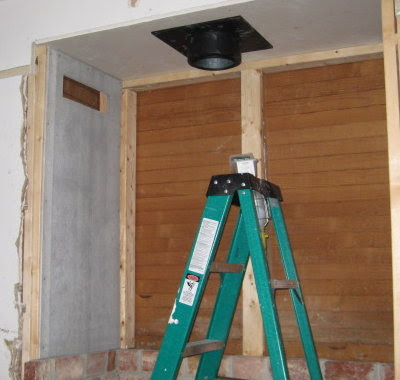 It was no more expensive than the standard mid-grade drywall, and we felt better using that. The stovepipe ceiling support went in next. Dan also added additional framing for the cement board. Cement board is commonly used in bathrooms, because it is mildew, moisture, and mold resistant. It is usually covered with tile. It is also used for heat shields for woodstoves. 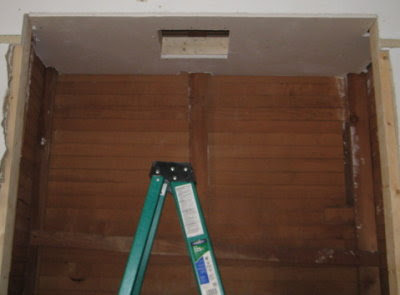 It required a masonry saw blade to cut it, and had to be attached with cement board screws. 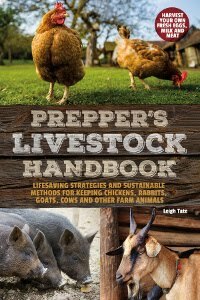 It comes in 3 by 5 foot sheets. We used four for the upper alcove walls. The cut-out rectangles at the top are to accommodate wall vents for the ventilated air space behind the cement board and bricks. 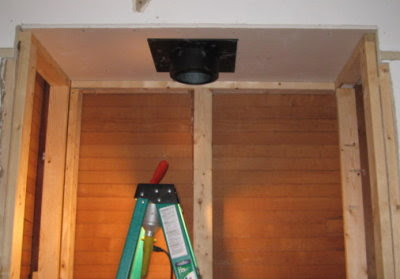 This is explained in this post, and enables us to place the woodstove closer to the alcove walls. This required a fiberglass tape and tileset mortar. Dan also trimmed and smoothed the rough cut edges of the alcove opening, and filled them in as well. Once it's dry, we can move on to the next steps: preparing the cement board for paint and cleaning the bricks. 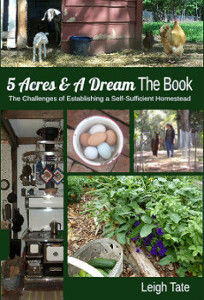 It feels like we're finally heading into the home stretch (click here to see that)! the last photo is flipped? note the straight edge on the wall on one side of the alcove vs the jagged edge. can't wait to see how you'll finish the space. It is looking very nice so far. Can hardly wait to see finished pics. What color are you painting the living room???? Renee, you are so observant! Actually, the rough looking edge there is the joint compound which does look jagged. DH filled in the walls to the side of the alcove OSB board and more cement board, and then covered the seams with tape and joint compound. I should have shown a close-up, but the whole mess will be covered with moulding in the end. I love the idea of a wood fill box, in fact, at this point I don't have a clue as to where we'll keep even a little wood indoors. Yes, the front porch helps there. And no, we won't have that much snow to deal with! It looks like its coming along! I am so impressed: you are so handy! And doesn't it feel good doing it all yourself? I had a grandfather who was a wizard with brick. He kept on saying it's just patience, that's all. But luckily we already had a large fireplace, so we had no trouble fitting the stove of our choice. Have you chosen a stove yet? Will you get new rabbits, to feed the apple peels to? When you first started I was of course befuddled, I didn't understand what you were doing. Since I only had a fireplace in NJ when I was a kid, I don't remember and in Florida, well we love our A/C and fireplaces or stoves are a luxury. I can see what your plan is and am really excited for you. The fire place is looking great!!! You sure do have a talented husband!! Yes, Julie, and I'm relieved! Katrien, we have a Woodstock Soapstone stove. Originally we thought we could use our fireplace for this stove, but the chimney was in too bad of shape and the whole thing had to be torn down. Deep End, it was hard to accurately explain what was going on. Pictures say it so much better! Ah, the joys of old fireplaces! Looks like the rebuild will be wonderful. I hope the cool weather holds off until you get it finished. There is nothing quite as comforting as good wood heat, regardless of the extra work needed to keep it up. In our old house we just had both chimenys inspected to find out that while one is fine, the other stove had it's stovepipe hole cut right into the smoke chamber and so far nobody seems to be able to figure out a fix. Looks great, I am in the process of doing something similar, but I believe that my alcove dimensions are too small. My alcove dimensions(after removing the chimney and pre-fabricated fireplace) are 30" deep, 42" wide and about 7' tall. the inside looks alot like your first did. Do you mind telling me the dimensions on yours? Gladly, Art. 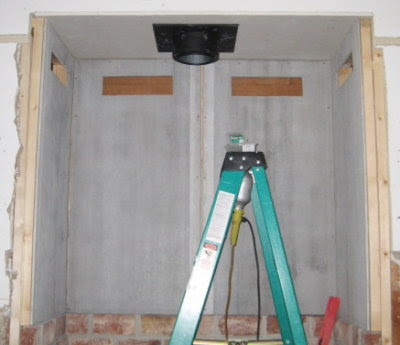 The finished dimensions of the upper part (cement board) of the alcove are 23.25 inches deep by 50.5 inches wide. Height from hearth to alcove ceiling is 91." (Our ceilings are 8'10"). The lower brick portion sticks out about 3/4 of an inch more than the cement board. We used 1/2 inch cement board and left a minimum 1 inch air space behind that (and the bricks). So our rough alcove was approximately 25 by 53 inches before cement board and brickwork. As you can see, the brick hearth is somewhat raised and extends beyond the alcove. It's finished dimensions are 5" tall, 42" deep, and 57" wide. I hope that is helpful. If you have any other questions, we'll be glad to answer what we can. Good luck on your alcove! We're very happy with ours.